A playful font introduces your wedding details in the graceful and lighthearted manner you've been looking for. This product features thermography printing. Thermography is a unique printing technique that results in raised lettering you can feel, which adds to the luxurious experience of this printed piece. 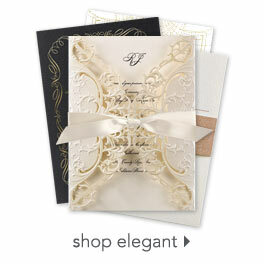 Personalization Options: "Let's Celebrate" is printed as shown in your choice of color. Your wording is printed in your choice of colors and fonts.